Collingwood Neighbourhood House invites you to lunch every Tuesday and Thursday. Full meal prices are $6.25 for adults, $5.00 for seniors, $4.00 for students and $3.25 for children under 12. Items can be purchased a la carte or “to go”. There will be a Women’s Safety Workshop with female police officers from the Vancouver Police Department who are volunteering their time. The workshop is tremendously empowering for women and will help make our neighbourhood safer. Those who wish to attend must pre-register though the Collingwood Community Policing Centre, 5160 Joyce Street, 604-717-2935. In a world desperate for water, a band of ‘Water Miners’ explore a post-apocalyptic underworld in search of pipes that may contain the prized element. In a desperate struggle to stay alive, the band of brothers stumble upon the tragic reason for the earth’s drought problem. Upon receiving sage advice from an Old Mage, the group goes in search of the 4th Element in order to restore balance in the world and save their dwindling society. But can the Water Miners adopt the sage advice? Can they find balance within themselves and work together in order to save their dying planet? Stage Door Theatre Troupe presents “The 4th Element”. A play about the human spirit, overcoming individual selfishness, and the awareness of how we together can harm or heal the world in which we live. Tickets: $15 at the door. The purpose of this program is to provide support for persons with disabilities who are also receiving income assistance from the authorities identified. Camping for free – what are the criteria? If you meet any ONE of the following criteria, your camping party can camp for free. There is also no charge for a second non-recreational vehicle. Welcome to the Vancouver Inspiration Pass. Opening the door to exciting experiences and fun things to see and do across the city, the Vancouver Inspiration Pass is a free cultural and recreational pass program that allows individuals, families and teens to explore their city like never before. Free for Vancouver residents aged 14 years and older, the pass is valid for a period of two weeks, and can be borrowed through any Vancouver Public Library location. There are 140 passes available for loan every two weeks – 20 are available through the Central Library downtown and six passes available at each of VPL branches across the city. Response to the pass has been tremendous. We are working hard to ensure that eligible patrons receive passes as quickly as possible, so that as many resident as possible can enjoy this outstanding program. Given the strong interest and limited number of passes, however, some patrons will experience a wait before a pass becomes available. We appreciate your patience. 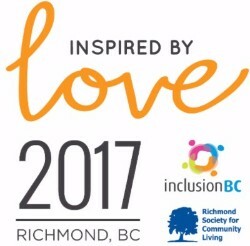 Inclusion BC’s annual event is Canada’s leading forum for inspiration, sharing and learning on intellectual disability, human rights and inclusion. The theme for 2017, Inspired by Love, celebrates the human bonds that forge our sense of shared community, the power of compassion and of sharing our own vulnerabilities. Where: Sheraton Vancouver Airport Hotel in downtown Richmond.